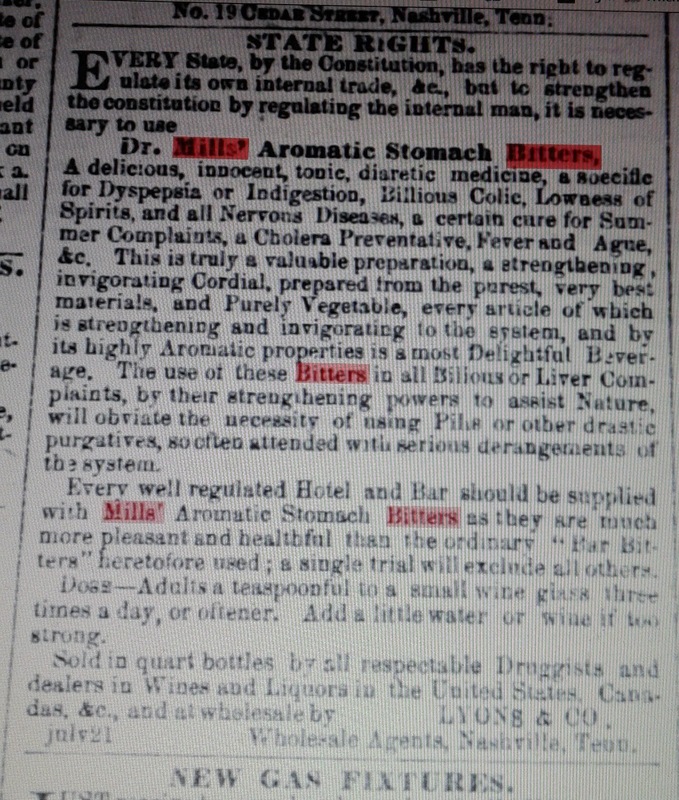 The first listing for the Mills' Bitters in California is in, The Shasta Courier, July 22, 1854. 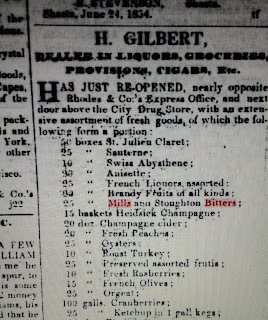 It shows H. Gilbert of Shasta, Cal. selling it. 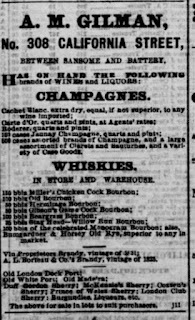 Here is an ad from the Nashville Union and American, Dec. 2, 1855. 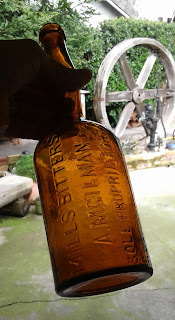 It shows what the Mills' Bitters was made for and from whom. 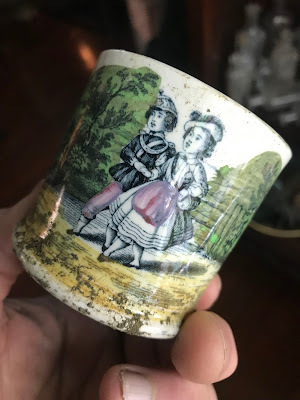 It was highly advertised in Nashville, Tenn. during the 1850's. 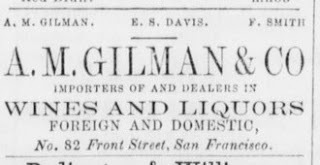 The first listing for A.M. Gilman is in the San Francisco directory 1854. He is listed at 106 Battery St. S.F. 1861 - 324 Front St.
1862 - 414 Front St.
1864 - 409 Front St.
1871 - 322 Washington St.
1873 - 308 California St.
1880 - 1516 California St. 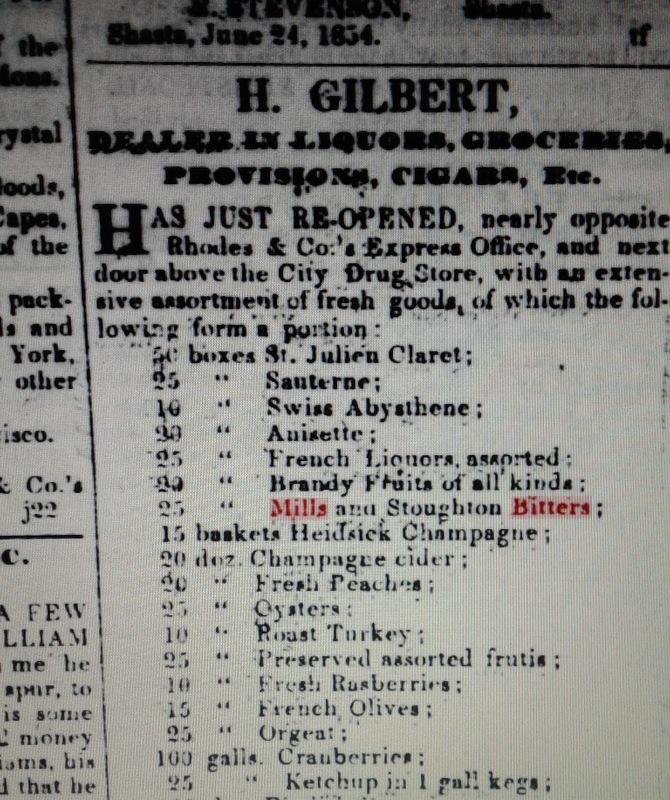 There is no listing for A.M. Gilman after 1880. The newspaper ads I found for A.M. Gilman start in 1857. 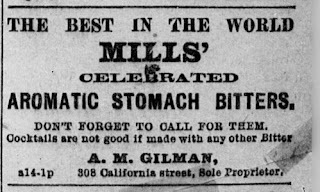 This is the first and only ad for the Mills' Bitters and the very last ad for A.M. Gilman. 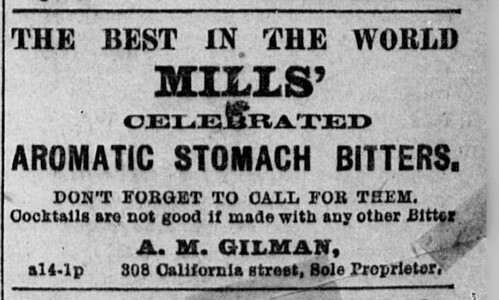 Strange that Mr. Gilman waited until the end of his career to produce the Mills' Bitters. 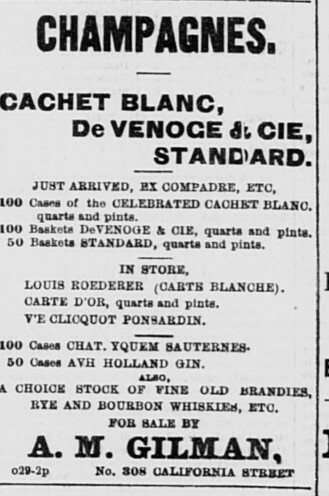 After this ad in 1878, he is only listed one more time in 1880. 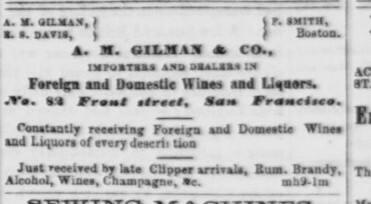 He is listed as a merchant at 1516 California St. After that he disappears. 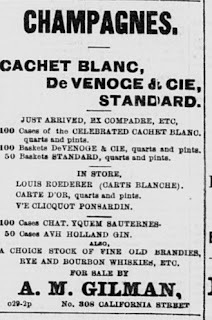 Shortly after Mr. Cassin takes over the brand. 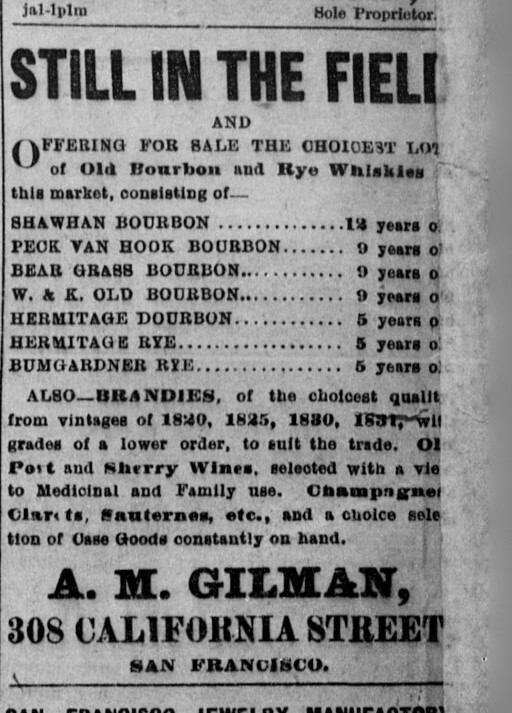 Mr. Gilman had a 26 year run in the liquor business. He had only one liquor business in the Santa Cruz area fail. 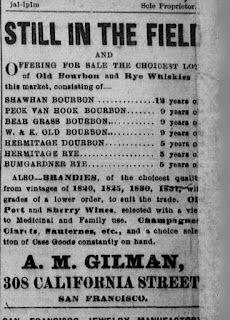 But, the great thing that A.M. Gilman did is produce a rare one year only Western Bitters. 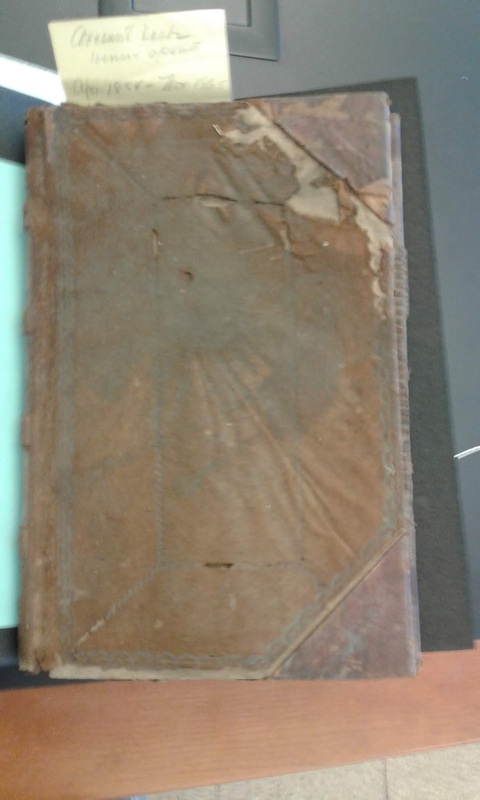 The "London Jockey Club House Gin" ledger book has been discovered. Many questions will be answered. Who created it and where, who was buying it and selling it. Even the names of the sailing ships they were delivered on and how many cases made it to California and the West. A full article on the complete history of the London Jockey coming out soon in the Antique Bottle & Glass Collector magazine. 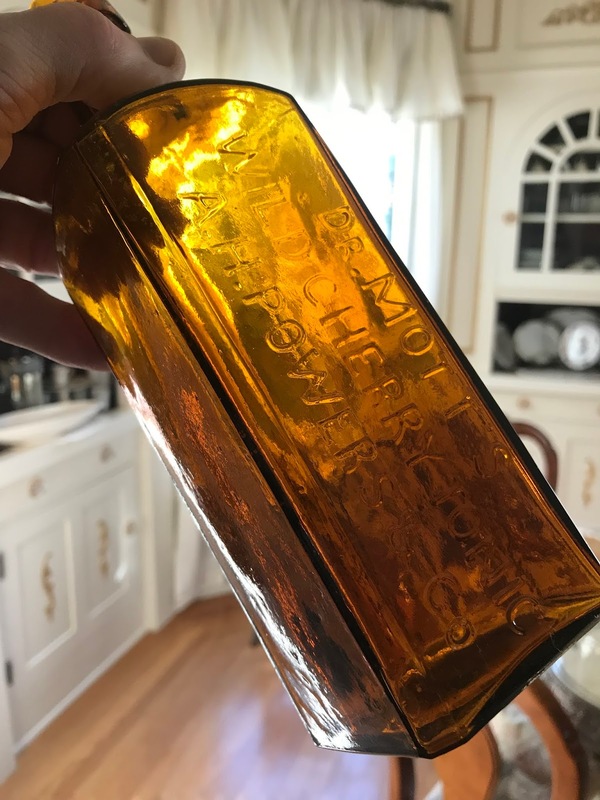 Dr. J. Hostetter’s Stomach Bitters was first marketed in an embossed bottle, on the Pacific Coast, as early as 1858 by the firm of Park & White of San Francisco. 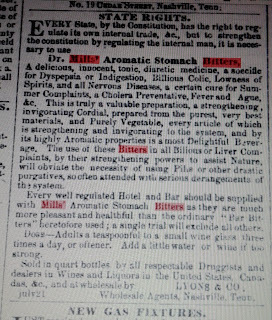 David Hostetter, with his father’s re cipe for bitters, and George Smith with the capital to produce and market the product, in 1853, formed the firm of Hostetter & Smith. 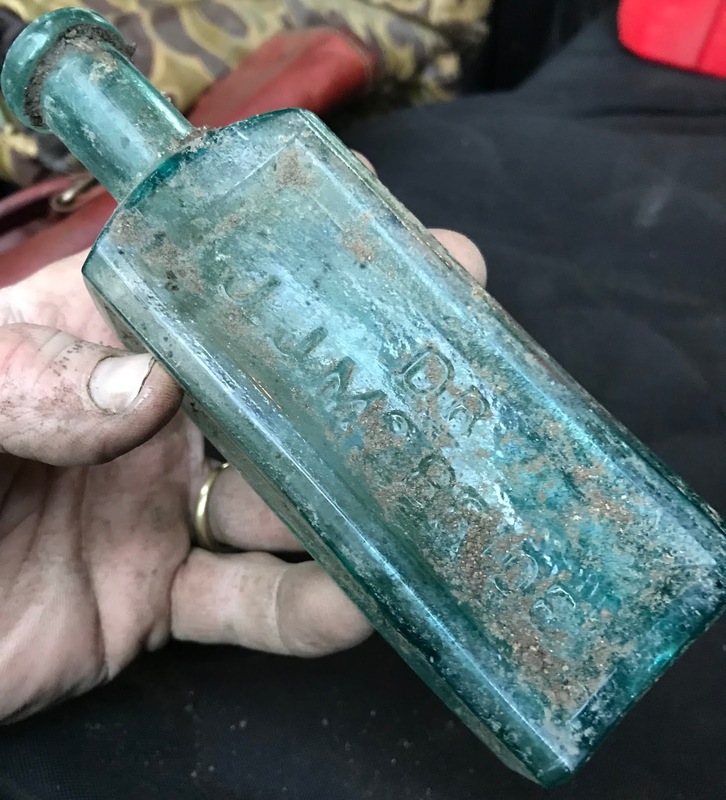 The first containers produced for the western market were the large 31 ounce size black glass or amber bottles that were manufactured for the Pacific Coast. 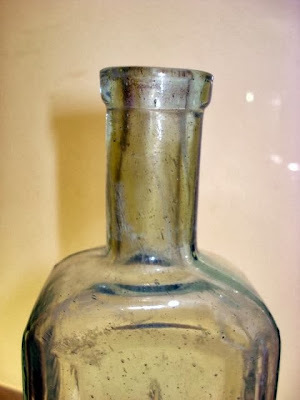 A 27 ounce bottle was also produced for the western market. The large blacks or ambers are rarely unearthed east of the Rocky Mountains and almost all examples have been discovered on the west coast. The large size Hostetter’s were distributed until sometime around February 1865 when in an advertisement run by Hostetter, Smith & Dean they claim to be discontinuing “the old size large bottle used exclusively in the west” and replacing it with the small size 20 ounce bottle. This information leads me to believe that if you are digging the large size Hostetter’s here in the west you are digging a bottle made before 1865 and possibly as early as 1858. 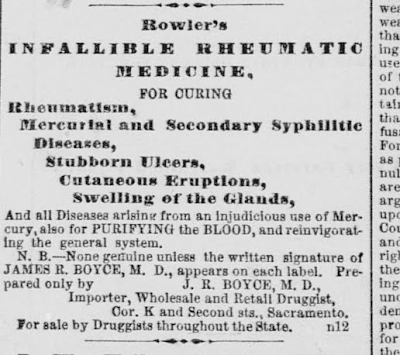 Charles F. Klink, a druggist also from Sacramento, approached Charles Roller with a proposition to manufacturer Roller’s rheumatism medicine and split the profits from the sale of the product with Roller. 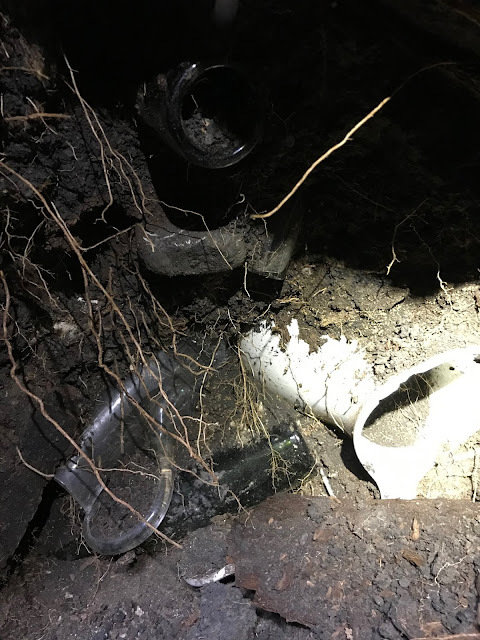 Roller declined the proposition and Klink began informing the public that he (Klink) had the original recipe that Roller had bought or brought from New Orleans. Dr. Boyce was a larger than life character, well respected and besides pushing the Rowler's product practiced medicine in Sacramento. While walking on the corner of Sixth & K Street one day with John Cassidy a man named William Tierney discharged a revolver at Cassidy. The ball struck Boyce in the back and passed entirely through his body. Cassidy immediately ran down K Street and Tierney followed behind still firing at him. In all, three shots were fired and after the second shot Cassidy cried out, I'm shot! I'm shot!. The ball passed through his clothing, grazing his skin. but did no injury. Boyce, on the other hand, was considered in critical condition by his attending physicians. As it turns out Cassidy was accused of improper intimacy with Tierney's wife and Tierney had been "gunning" for Cassidy. The Rowler's comes with a pontil and also a smooth base variant. These bottles were manufactured at the second glass works to begin operation in San Francisco. 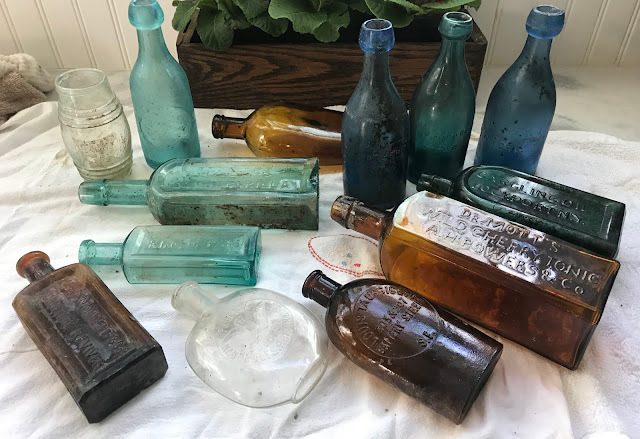 The glass works was built in May of 1860 and manufactured several different medicine bottles, to include the Dr. Bowen's Blood Purifier and the Adolphus Anti Rheumatic Cordial bottles as well. All examples, that I know of, were dug in the west. 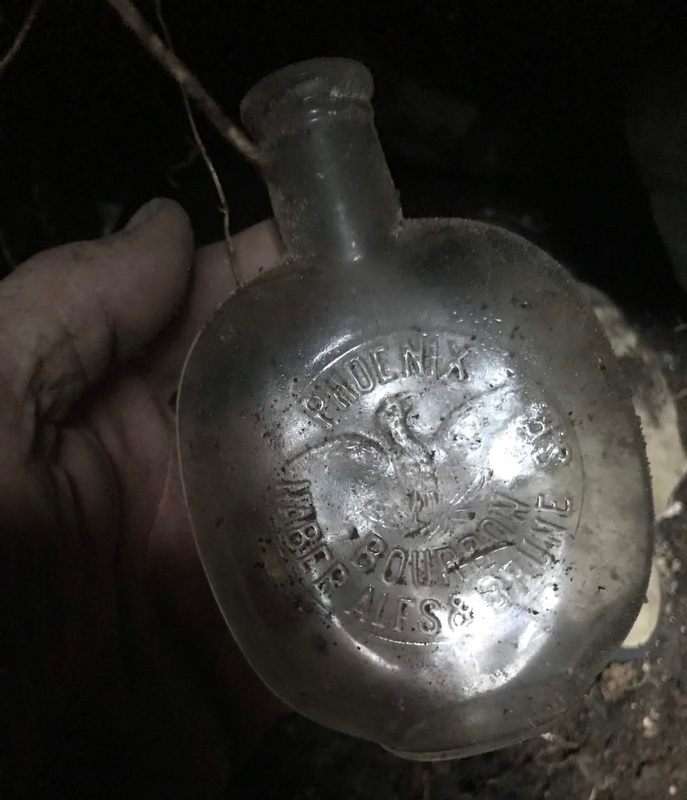 These bottles are pretty scarce and I know of one intact example that was unearthed in the Nevada City area in the early 1990's. The late Mike Dolcini dug two Rowler's in Sacramento, one pontiled and one smooth base. Although scarce, the "Rowler's" are not exactly rare. Several were unearthed in Old Sac back in the late '60s and early '70s. 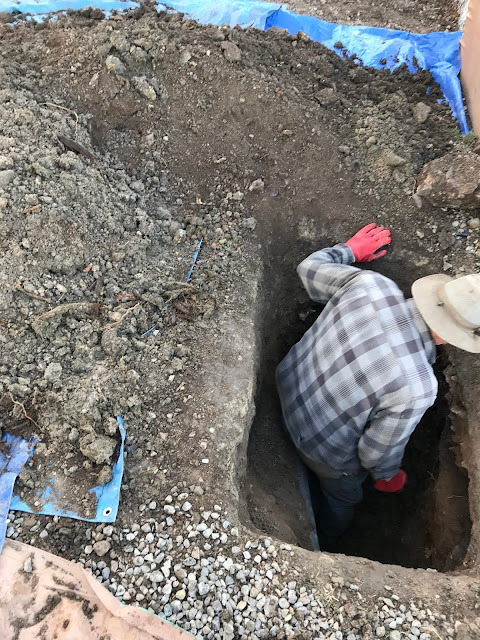 One pit we dug under what is now Fanny Anne's Saloon produced 2 mint and several damaged OP Rowler's. 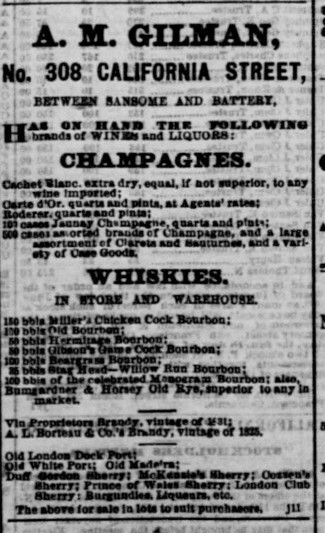 At the time, they brought relatively high prices, $125 to $150 in the considerably higher dollar value of those years. 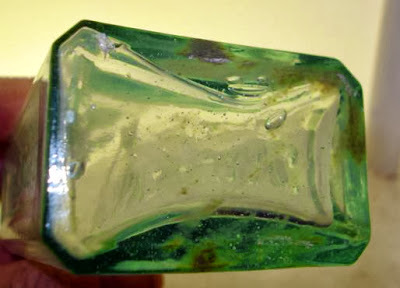 I recall one darker green example bringing the princely sum of $225 at an early Sacramento Bottle Show. In the years since, only a couple have been dug in Sac'to. One on D St, between 13th and 14th, in Alkali Flat, and another on 12th and Q after the old Pepsi Cola bottling plant was removed to make way for another state office building. Specimens may have been dug by others that I am not aware of, including the rumor of one dug in Marysville. Quite a while back I acquired a bottle that I knew absolutely nothing about and had never seen before. What intrigued me about the bottle was the name CAL. 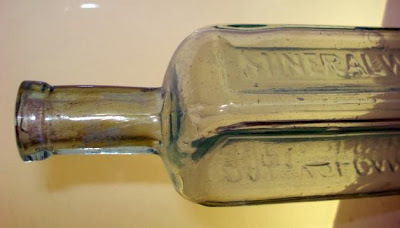 VOLCANIC MINERAL WATER CO. embossed on the side panels of the bottle. Even though the name Cal. Volcanic was enough to spark my interest the "R's" in MINERAL and WATER were of the curved variety. 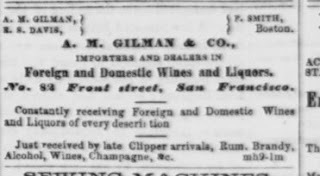 Those curved "R's" are associated with the bottles blown in San Francisco and that was the clincher for the purchase. The first mention of the Cal. 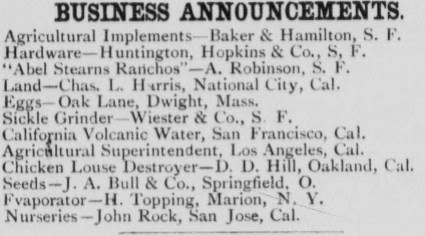 Volcanic Water Co. product, that I could find, was in the 1880 Sacramento Daily Union newspaper. 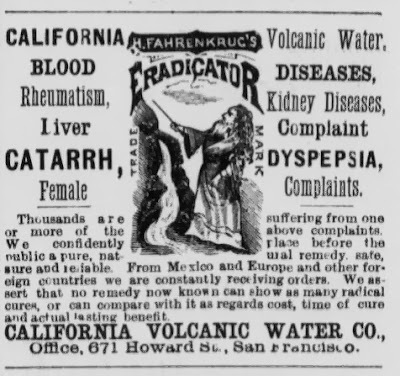 As you can see in the ad the mineral water was discovered in Southern California and was known as Fahrenkrug's Eradicator. 1883 Pacific Rural Press advertisement for the California Volcanic Mineral Water. A remedy for blood diseases, rheumatism and liver complaint. A cure for kidney disease, dyspepsia and female complaints. The bottle is shaped like a medicine, the contents are from southern California. Heck, this is a western medicine in Fahrenkrug's disguise of some sort of a mineral water eradicator hallucination If its shaped like a medicine, claims to cure ailments such as blood diseases etc. and has the word California embossed on the bottles with the western R's, in my book, that's a western medicine.